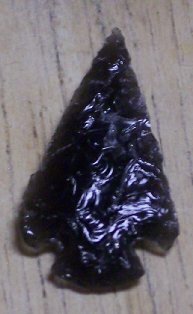 Many items other than arrowheads can be flintknapped out of Obsidian or Glass. These are decorative items that are cool conversation pieces. Most resemble a particular animal. These items will have a month delay for shipping. Arrowheads can be made into good gifting objects by the simple addition of a magnet. Here can also be found other flintknapped items with a simple addition of a strong magnet back. These items will have a month delay for shipping.